In March 1916 the second competition of the London Combination wartime league was proceeding along its seemingly haphazard way through its penultimate month. As noted earlier, not every team in the league played each other, and the league had all the looks of something that was put together quickly to fill up the remainder of the season, following the first league. As for the government it needed more money, and it needed it fast, and so having already doubled income tax, it now raised it again. However it is interesting to note that what was then seen as an absolutely outrageous charge of 25% on everyone’s income, which could only be excused because of the nature of the war the country was now involved in, is now considered to be reasonable as a normal level of tax in peacetime. There was however even more taxation to come – as we shall see in a moment. On the football front Arsenal, on the same day as income tax increased, lost 0-3 at home to Tottenham. 10,000 turned up at Highbury to see the game. Thus far in the war we have noted the progress of Henry Norris, rising from being Mayor of Fulham – an important position in local politics, but hardly of national interest – to being given an officer’s rank in the army, in recognition of his work in raising and paying for the training of two battalions. We have also seen how Henry Norris’ expertise in administration shone through in the way he was able to arrange the recruitment programmes that ran before conscription, while most other parts of the country were unable to do anything of the sort. Norris was therefore given the officer rank of Lieutenant in the army both in recognition of his work for his country, and also so that he could fit into the military hierarchy when dealing with recruitment and the handling of the battalions he raised. Majors and colonels might not know who he was, but once they saw his rank, that told them most of what they needed to know. And of course the men he recruited needed to appreciate that he was a proper military officer who needed to be addressed as “sir”. But now matters were taken further because on 9 March 1916 Lt Norris was given a full-time job by the War Office. I don’t know how this came about and Sally Davis who has researched his life more assiduously than anyone else, is also lacking in information on this, which suggests that the army approach Lt Norris, rather than Lt Norris approaching the army for more responsibility. My guess is that having shown himself to be outstanding at recruitment, administration and organisation, he was now given the task of supervising the recruitment and management of recruiting officers in the Number 10 district plus told to pass on his knowledge of how he managed to get the job done so well, while others around him struggled and gave excuses. Army Order No 324, issued on 21 August 1914, had authorised the formation of a ‘New Army’ of six Divisions, manned by volunteers who had responded to Earl Kitchener’s initial appeal for recruits. Each division was to be under the administration of one of the six regional Home Commands, and Eastern Command formed what became the 18th (Eastern) Division in September 1914, based for the duration of the war at 50 Pall Mall, London. The 18th (Eastern) Division was an infantry division and from its creation the division had trained in England until 25 May 1915 when it landed in France and spent the duration of the First World War in action on the Western Front, becoming one of the elite divisions of the British Army partaking of course in the Battle of the Somme. Davis tells us that Norris’ job this was a “civilian post, newly created in the wake of the first national service acts.” However although the 18th (Eastern) Division was based in Pall Mall, Captain Norris was based in Worthing, Sussex, but it seems he still returned to London on occasion, for the records show that he attended the monthly evening meetings of the full Fulham Council (which was only once a month from 1915-18) but not any daytime meetings. Meanwhile Henry Norris’ wife Edith took over his role in certain realms of her husband’s work, such as with the Hammersmith and Fulham District Nursing Association. The exact nature of the work of Henry Norris with the 18th Division is not known and this is one of many places where one wishes that either our subject had kept a diary, or the war command had been more forthcoming after the war as to who did what and where and when. But of course, after the war, the focus was entirely on rebuilding. Nostalgia was still a long way away in 1918. Certainly in something as peripheral to the central issue of management of the war effort as football, Henry Norris now had no involvement. But of course the matches continued and on 11 March there was another defeat – this one away to Millwall. Arsenal was clearly lacking leadership with both Henry Norris and the manager now no longer at the club. And it was not only football that Norris pulled away from, for on 15 March Henry he resigned as the chair of the London Borough of Fulham military tribunal. He was still a director of Fulham FC, and the chairman of The Arsenal, not to mention Mayor of Fulham, but the clubs and the Borough were now to see very little of him until the war was over. Moving back to the day Henry Norris was given his appointment and his rank of Captain perhaps we may note in passing a totally different matter, for on the next day Hubert Parry wrote his choral setting of William’s Blake’s poem “And did those feet” which later became known as “Jerusalem” – perhaps the most famous patriotic song in England after God Save the King (as it then was) in 20th and 21st century England. As for the rest of the month’s football there was some relief as on 18 March Arsenal beat Brentford 5-2 at home in front of a crowd of 6,000. But for Reading away on 25 March only 1500 turned up for a 1-1 draw. However although in terms of football Captain Norris was now removed from day to day activity we can be sure that tucked away in a bureau at his London home there was a thick file on match fixing, 1912 to 1915. He knew it was there, and he knew he would return to it, but that was for the future. From here on we have Henry Norris engaged even more completely in his war work than before, and not visible in a way that would be recorded in the media or in public records. We saw that soon after the outbreak of war he had volunteered for the army, and been turned down because of age, eyesight, and the fact that right from the start the value of his work in recruitment and administration was recognised. Now he was able to serve his country as he had tried to do in 1914. He wasn’t on active service overseas, but he was putting his greatest skills – those of administration – at the service of his country. I have already (in my article on October 1915) noted that Britain is a country that tends to denigrate administration as a low-level job of little significance, and that those who do run administration systems generally get in the way of those who make progress. But even the most gung-ho military general will know that without proper military intelligence and an organisation to sort out that intelligence and get it to the right people in the right place at the right time, disaster will always loom. To push this point perhaps I may add that I did, for a while, work with the RAF writing recruitment material (which I suppose is one reason why I have so much interest in Norris) and one of the campaigns we came up with posed this question… If you were sending out a team to establish a base near the front line with enemy territory in the middle east, who would you put on the first plane, besides the fighting men and women? A list of options was given by way of suggestions, and the piece made it clear that others could included too. We listed pilots, engineers, communications experts, linguists and so on, but deliberately left out one particular person. Only a handful of people ever picked up who it should be: it was the cook. Without decent food, you can’t expect people who are putting their lives at risk every day, to keep their morale up. It is a trivial example, but it does, I believe, show in just a couple of sentences that having people who think about the way operations are working, who think about how other people think and react, and who can make use of that knowledge, can be invaluable. Although we don’t have details of what Captain Norris did day by day, his ability to organise and administer, must have been what led him to be offered the job and the promotions that went with it. Of course I have no direct evidence, and the fact that Henry Norris was self-made man, a property developer, and a man whose ancestors had written nothing in the pages of England’s history, would have worked strongly against him becoming an officer at all. But clearly his talent for organisation and administration – a talent that had seen Arsenal rise from the graveyard of crowds of 5,000 and 6,000 to being one of the best supported clubs in the country – even when they were eventually in Division 2 – was at this stage most certainly recognised. Captain Norris moved into his new job just as German airships launched a series of nightly air raids on England – and one wonders if Norris did actually receive details of Arsenal’s games in his early months in Sussex. If he did, it would not have relieved the negative feelings of the war news very much. April was the final month of the London Combination season (part 2) and it started on Saturday 1st with a win over Clapton Orient. Encouraging though this was, it was followed by an away defeat to Tottenham on the following Saturday 2-3. On 15 April Arsenal were back at Highbury for a goalless draw in front of Millwall Athletic – the old local rivals from the south London days. The game was always a big draw, and 9,000 showed up – more than turned up at White Hart Lane for the Tottenham Arsenal game. But Chelsea however were a different matter for they were the powerhouse of this supplementary League exactly as they had been in the first part of the season in the original London Combination, and they subjected Arsenal to a 9-0 thrashing in front of 25,000 at Stamford Bridge. On 24 April Arsenal played the return match against Chelsea at Highbury. Arsenal lost again – but at least this time it was only by 1-3, with 13,000 in the crowd. However even if Norris saw nothing of the football, he would surely have heard, through the military grapevine (if not through the papers which carried virtually nothing of the news) of the events which began on 24 April 1916 in what was to be known as the Easter Rebellion in Ireland, as republicans launched an uprising against British rule. It was the most significant rebellion since 1798 and the British army put down the rebellion with absolute ferocity. The rebels unconditionally surrendered on 29 April. As a result of the uprising Ireland was placed under martial law and around 3,500 people were taken prisoner by the authorities – many of whom had played no part in the Rising. About 1,800 were placed in internment camps and prisons, and the leaders were subject to courts-martial and shot. There surely can be little doubt that the severe way in which the Rising was dealt with led to greater support for the rebel cause and it is notable that in the December 1918 general election Sinn Féin won a landslide victory and subsequently declared the independence of the Irish Republic. Meanwhile Germany continued to increase its pressure on Britain and British forces. On 25 April there was a united air and sea attack on Lowestoft and Great Yarmouth, and on 27 April a significant gas attack at Hulluch in France in which the 16th (Irish) Division was wiped out. Elsewhere on the same day British forces surrendered to the Ottoman Empire at Kut-al-Amara. The war was not going well. Back with the football, 29 April was the last day of the first season in the war league. Arsenal lost 1-2 away to Watford, making it four defeats and one draw in the last five league games. 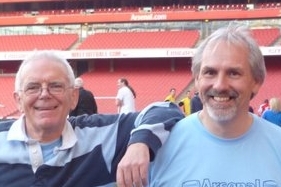 It was however not the final match for Arsenal as on 6 May the club played a London Combination XI in the match to honour, and raise money for the family of, Bob Benson, whose tragic death during a game for Arsenal we noted earlier. The result of this match was 2-2 with 5000 in attendance. Here are the game details of the Combination matches through March and April, and the fund raising friendly on 6 May. There was however another event of note around this time, for on 30 April which although it would have passed unnoticed in much of Britain did cause something of a stir in government quarters, and went on to have a very long lasting impact on the lives of many people around the world. Germany introduced Sommerzeit – or Daylight Saving Time. The aim was to change the clocks in order to conserve coal during wartime and as news of the idea reached Britain it caused much consternation in Parliament, as several rather baffled MPs proclaimed that with Germany now being two hours ahead of Britain, the country could be invaded while the British slept in their beds. Others however had a better grasp of the idea, and it was adopted across most of Europe soon after. The notion of moving the hour forward during the late spring, summer and early autumn was simple: the ensure that the hours of daylight were the hours of productive working. Of course the government could have said “you are no longer working 9am to 5.30pm, instead you are working 8am to 4.30pm” but the reality is many would have simply refused to obey. But change the time, and everyone goes with that. All the clocks change, and we tend to work to what the clocks say. As spring proceeded towards summer the Zeppelins continued to raid the east coast of England. Indeed on 2 May there were reports of a fleet of eight sited at once approaching the coast. And on 15 May the government having raised income tax twice, introduced another tax – the Entertainment Tax (technically Finance (New Duties) Act ss1-2 and the Finance Act s12). To understand the impact of this, one needs to note that this was long before Valued Added Tax (VAT) was introduced (1973) and indeed long before Purchase Tax (1940). Until this moment the notion of paying a tax at the moment of buying something, was quite alien to the British economy, but now it was introduced. Although neither Entertainment Tax nor Purchase Tax exist now we do still have a version of these with VAT which covers most purchases within British life, except a few that are specifically excluded. Entertainment tax ran through a set of bands and the table below shows the rates introduced in 1916. They were amended (but not abolished as Henry Norris wished) in 1920. The prices are of course in pre-decimalisation money where d is an old penny, and s is a shilling. There were 12d in a shilling (written 1s or 1/-) and 20 shillings in a pound (£). The cost of entering the football grounds for top clubs (which included Arsenal even though in the second division) was normally around 2d. Although prices were reduced for wartime matches I can’t confirm the cost of going onto the terraces at Highbury at this time but it was either going to be a penny, a penny halfpenny (1.5d) or twopence (pronounced tuppence). So the tax meant a rise of 25% or 50% on the cost of entrance. On 21 May daylight saving time, having passed through Parliament, was introduced and the clocks all went forward one hour. As for the war the month ended with the Battle of Jutland the only large scale battle between battleships of Germany and Britain. Prince Albert, an officer in the Royal Navy was present on one of the Royal Navy ships. There was no obvious victor but the dominance of the Royal Navy in the North Sea was maintained.